I once wrote that China planted a great green wall to stop desertification. It seems some African nations are willing to follow this example in order to stop the Sahara from going South. The dozen nations involved in this most ambitious project are lacking the necessary funds, and are calling rich nations for help. 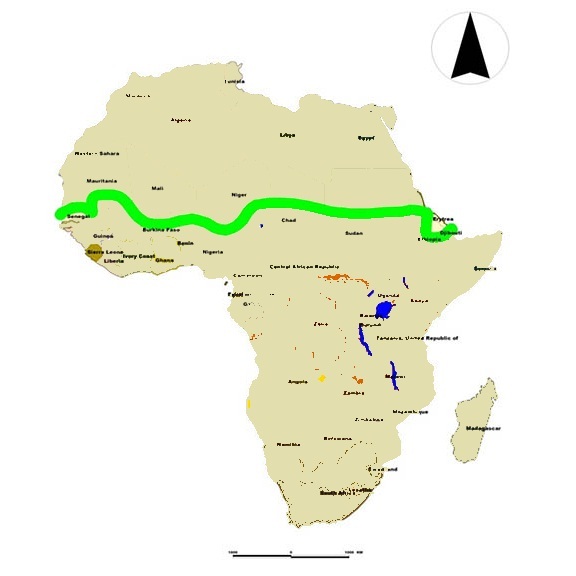 It is envisaged that the belt would go through 11 countries from east to west. The trees should be “drought-adapted species”, preferably native to the areas planted, the Great Green Wall website says, listing 37 suitable species. The initiative says it hopes the trees will slow soil erosion; slow wind speeds and help rain water filter into the ground, to stop the desert from growing. It also says a richer soil content will help communities across the Sahel who depend on land for grazing and agriculture. The whole project is expected to cost at least $3 million to plant and take two years to complete. Progress has slowed on enacting the plan, first envisioned five years ago, due to a lack on funding and concerns that once planted the Great Green Wall will not be properly maintained. Should it be completed, the 37 recommended drought-tolerant native plant species making up the wall would slow soil erosion, slow wind speeds and enable more rain water to be absorbed by the ground. It’s a fascinating project, should it ever really get into the ground. I believe the project is rather due to cost three billion than millions, which makes the need for the financial help of developed nations. This article makes me think that I should write an article with a list of huge projects that can make a difference on a global scale. What do you think ? Yes, please write that article about huge projects, with updated data then try and give us a follow-up every month or so. Moreover you should add a permanent page concerning fundings and how/where to send the funds.